His feast day is December 27. John was the son of Zebedee and Salome. He was a fishermen. John was the brother of St. James the Great, and called one of the Sons of Thunder. He was a disciple of St. John the Baptist and a friend of St. Peter the Apostle. John was called by Jesus during the first year of His ministry, and traveled everywhere with Him, becoming so close as to be known as the beloved disciple. John took part in the Last Supper. He was the only one of the Twelve not to forsake the Savior in the hour of His Passion, standing at the foot of the cross. John was made guardian of Our Lady by Jesus, he took her into his home. Upon hearing of the Resurrection, he was the first to reach the tomb; when he met the risen Lord at the lake of Tiberias, he was the first to recognize Him. During the era of the new Church, he worked in Jerusalem and at Ephesus. During Jesus' ministry, he tried to block a Samaritan from their group, but Jesus explained the open nature of the new Way, and he worked on that principle to found churches in Asia Minor and baptizing converts in Samaria. He was imprisoned with Peter for preaching after Pentecost. 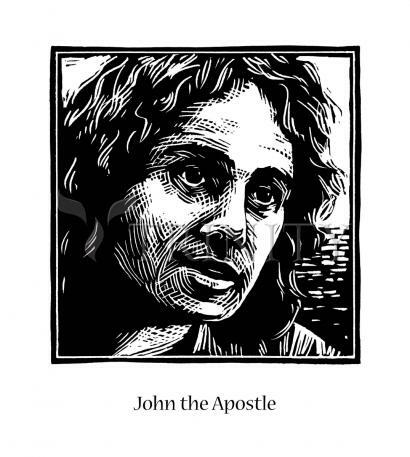 John wrote the fourth Gospel, three Epistles, and possibly the Book of Revelation. He survived all his fellow apostles. Emperor Dometian had him brought to Rome, beaten, poisoned, and thrown into a cauldron of boiling oil, but he stepped out unharmed and was banished to Patmos instead. When John was en route to preach in Asia, his ship was wrecked in a storm; all but John were cast ashore. John was assumed dead, but 2 weeks later the waves cast him ashore alive at the feet of his disciple Prochoros. When John denounced idol worship as demonic, followers of Artemis stoned him; the rocks turned and hit the throwers. He prayed in a temple of Artemis; fire from heaven killed 200 men who worshipped the idol. When the remaining group begged for mercy, he raised the 200 from the dead; they all converted and were baptized. Drove out a demon who had lived in a pagan temple for 249 years. Aboard ship, he purified vessels of sea water for drinking. Ceonops, a magician, pretended to bring 3 dead people come to life; the "people" were actually demons who mimicked people so the magician could turn people away from Christ. Through prayer, John caused the magician to drown and the demons to vanish. Once a year his grave gave off a fragrant dust that cured the sick.